Britannia has established itself as a major national and international academic journal. 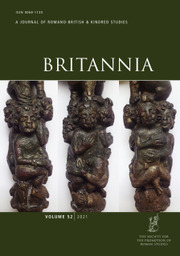 It is the foremost journal for the study of the Roman province of Britannia. It contains authoritative and significant articles, short papers and book reviews on all aspects of the archaeology and history of Roman Britain and its kindred studies - the latter including the Late pre-Roman Iron Age, the post-Roman period, other provinces of the Roman Empire - attracting contributions from experts around the world. In addition, Britannia includes an annual survey of new discoveries - sites, excavations, finds and inscriptions - pertaining to Roman Britain; this is an essential tool for research relating to the Roman period in Britain. Thinking about Roman Imperialism: Postcolonialism, Globalisation and Beyond?